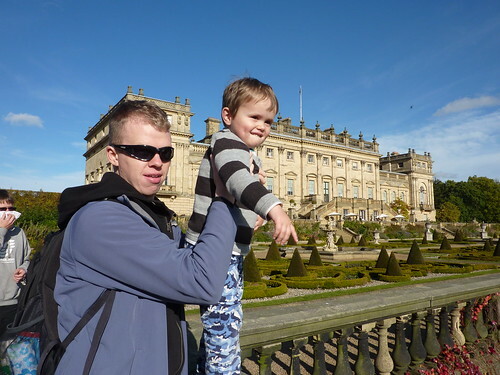 Yesterday The Mister and I had a really nice day out to Harewood House with Tom and Anne and their boys. It was for a food and folk festival and it was such a beautiful day. Local producers of foods and crafts were there with their stalls and they had some giant teepees sent up, one of which had musicians playing and another was a storytelling tent. I hadn’t been feeling terribly well the day before and was still feeling a little bit off-colour yesterday but it was such a gorgeous day that I had to go out! 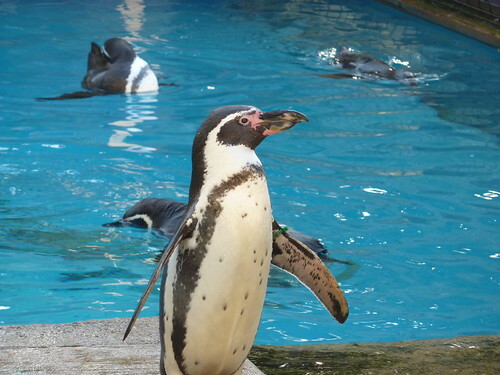 I thought I took loads of photos, but it would seem that most of them were of the penguins! 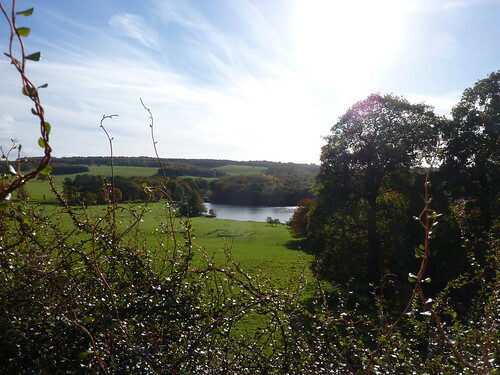 I really want to go back to Harewood to explore the house and the grounds properly and we will probably go back before Christmas for their Christmas festival because I want to see Santa! Bones to Ashes by Kathy Reichs is another good read featuring the anthropologist Temperance Brennan. She starts investigating the death of a little girl, and then follow two more murders. The story takes on a more personal feel though when Tempe is reminded of a childhood friend who vanished without trace. A really good story which races through at a cracking pace. Worth a read. The Perfect Lie by Emily Barr is a really good read. Lucy Riddick is living quietly in Cornwall with her boyfriend. Things are going fine until her friend’s daughter climbs a cliff and Lucy goes to rescue her. This would all be very heroic, except for the fact that someone videoed the episode and sent it to the TV news programme. What unravels is Lucy’s sad story of a dying mother, having to look after her brother, domestic violence and the sadness of abuse by an older man. She knows this man will come looking for her so she goes on the run. This was a really good book, but happily it all ended nicely! How to be Married by Polly Williams is an absolutely lovely book. Sadie Drew is a rather scruffy mum of a small child who is trying to be the corporate wife that her hiusband thinks he would like. She just cannot manage this and much of the book charts her mishaps with the proper corporate wives. One day she meets an old lady in the park who takes her under her wings and teaches her to be a perfect wife. This book is beautifully written and is so lovely. In particular that last few chapters made me cry, which as I was on the bus was rather embarrassing! The Naming of the Dead by Ian Rankin is an unusual book for him because it is set at real events at the G8 Summit in Edinburgh 2005. As a result there are lot of cultural references to politics, as well as to TV shows etc. The book is as much about Siobhan as John Rebus and it is a better story for it. The usual stuff of murders, police investigation and Rebus being a naughty policeman. A good read. 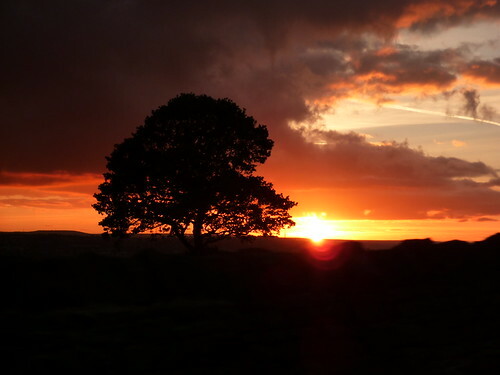 Road to the Dales: The Story of a Yorkshire Lad by Gervase Phinn is his memoir if his experiences growing up in Rotherham. I absolutely love his books, his stories make me laugh and the tone of his story-telling is just so genuine and lovely. His autobiography has much the same charm. He recounts stories of his close knit family members, many of whom would be fairly typical of post-war families but there is something very honest about them. This book is well worth a read, especially if you like stories about Yorkshire folk. I started reading Like Bees to Honey by Caroline Smailes but I just didn’t get it. I got about 80 pages in and couldn’t stick with the story. Maybe I will come back to it one day and give it another go, but not at the moment. I found her use of repetition particularly annoying, or maybe I am just in a bit of a grumpy mood! Sail by James Patterson and Howard Roughan is a good, if rather simplistic, read. After the death of her first husband Dr Katharine Dunn takes her three children and her brother-in-law off on a sailing trip to try and rebuild their family. She has since remarried a smooth-talking lawyer, and what she doesn’t know is that he is trying to kill them all so he can get all her inheritance. A fast-paced and easy to read book… think it only took me a couple of hours to read! The Neighbour by Lisa Gardner is an exciting read. The story centres around a young married couple Sandra and Jason Jones and their 4 year old daughter Ree. Sandra works in the day and Jason works at night. One evening he comes home to find Sandy gone and he becomes number one suspect in what the police suspect is her murder. An exciting book with lots of twists and turns, but ultimately a happy ending. Now I know Dan Brown gets really bad press but I really enjoyed his latest book The Lost Symbol. As with all his books it was a ridiculous search to solve a cryptic clue which could lead to world meltdown of something else equally ludicrous, but I did think it was an exciting story. Then again I also enjoyed The Da Vinci Code so who am I to judge what is a good book!!! Devil Bones by Kathy Reichs is a rather formulaic but otherwise rather enjoyable book. Pathologist Temperance Brennan is investigating what appears to be ritual killings with the elements of voodoo or something like that. As always she manages to solve the case whilst also fighting off an attacker. What a trooper! Worst Case by James Patterson and Michael Ledwidge was a much better book than I expected. I have sometimes found his collaborations a little underwhelming. He has a new hero to his stories, a detective called Michael Bennett. A man who has a busy job investigating the kidnappings of rich young people who seem to be being used to set an example to their materialistic parents. His work life is busy, as is his family life as he has 10 children, all of whom were adopted. It was a good book and I really liked the new hero! So far, I have had a lovely extended weekend. My Mum and Auntie Jen and Auntie Josie came over to visit on Thursday and left this morning. I was at work on Thursday and, very wisely I might say, left them to go shopping in Leeds. They seemed to rather successfully ‘do’ the shops… Jen and Jose are pretty much demon shoppers, Mum on the other hand has a much shorter attention span. A bit like me really! 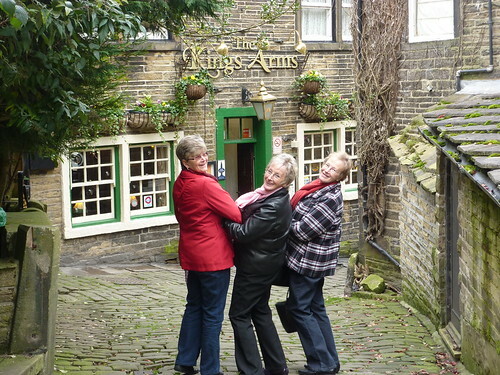 Yesterday I took them out to play and we went to Haworth which is where the Bronte sisters lived. 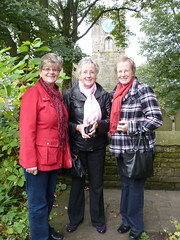 We went to have a look around the Bronte parsonage and then had a lovely lunch at a little cafe. Haworth is such a dinky little place and it has retained much of its charm. There are olde worlde shops, in particular the lovely sweet shop with plastic jars full of sweet like bonbons, sherbert lemons and midget gems. The only annoying bit was that we ot a parking ticket because Mum made the ridiculous mistake of putting it upside down so the date and time wasn’t visible. Stupid woman! Last night we all went out for a fabulous meal at The White Hart pub in Pool in Wharfdale. Not the cheapest meal out but it was delicious. The Mister, as usual, barely managed to get a word in edgeways. 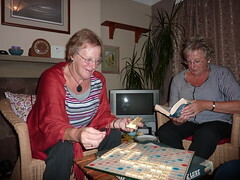 In between all this fun we managed to play the compulsory games of Scrabble. Not that we are all competitive of course! This morning I took them down to Matalan to do a last minute bit of shopping, but on the way we managed to get a complete puncture. I had a bit of a meltdown as I was worried about taking the old people to the airport. Fortunately I called the AA who came out to sort it out, and they removed a 3 inch piece of metal from the tyre! So the nice AA man followed me to the garage where I left the car and then The Mister and I raced up to the airport to say our final goodbyes! A slightly stressful end to a brilliant few days! 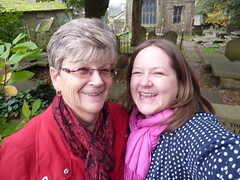 It has just made me realise again how much I miss my family, especially my Mum, but I also miss my aunts. We have such fun together and I value their support, love and friendship immensely. This last photo is the view on the way home from the shops tonight. So, so beautiful and such an intense colour. 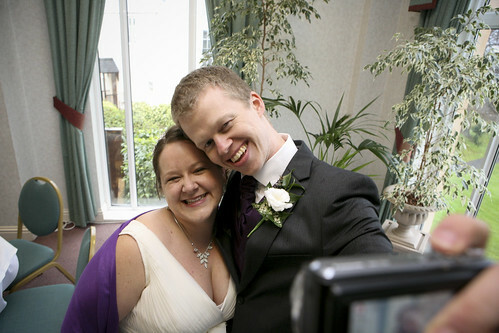 Well today is our 6 month wedding anniversary. Time has absolutely flown by and it seems only yesterday that we were planning our wedding. 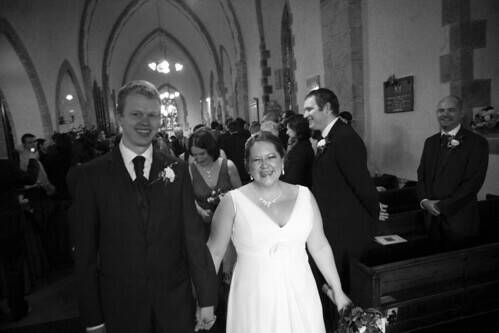 Those 6 months have been full of laughter and I have discovered that I am quite good at being married! The Mister is amazing and he makes me feel so safe, secure, loved, and he even makes me feel beautiful (even when I am definitely not feeling like that!) I am happier now than I ever have been and that is definitely due in part to the fact that I feel settled. Lots of people would look at our relationship and wonder how it works. I am loud, The Mister is quiet, but we seem to compliment each other perfectly. I guess that’s what it is all about… finding someone who makes you into a better person than you can be alone. The Mister smooths off some of my rough edges, and he goes a long way to making me a nicer person. Not a different person, just nicer! So, Mister. I love you, and thankyou for being my husband!